Follow in the footsteps of the pharaohs on this private pyramids tour from Cairo or Giza. 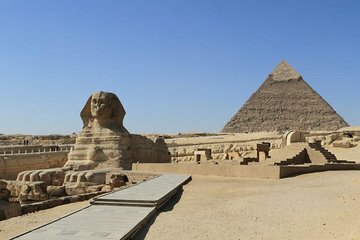 Hear the secrets of the Step Pyramid of King Djoser and the Sphinx, and enjoy panoramic views from the Giza plateau. Visit the Citadel of Salah El Din and the Egyptian Museum, and gain genuine insight into ancient Egypt. You’ll have free time to explore the bustling to khan el-khalili bazaar at your leisure.